Pretty cringeworthy, don’t you think? If this was in your inbox, you’d chuck it into your spam folder right away. Instead, I think we should spend a few moments looking at this message with a critical eye to the lessons we can learn. 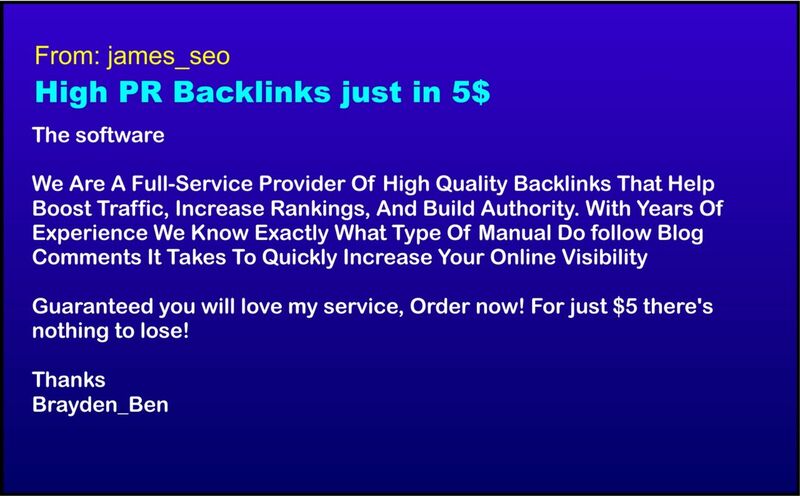 You wouldn’t think that five dollars for a selection of “High Quality Backlinks” could be a bad deal, would you? And yet it is. That’s because links to your professional website from a link farm actually have a negative value: the more such links you buy, the more your site will be discounted by Google and other search engines. Over and over we have reported instances of how shady backlink schemes have hurt business owners and managers. So it’s important to recognize that this email message is offering a dubious bargain from the get-go. Moreover, you have no way of knowing in advance if the “Order Now” link will load malware into your computer or network. Everyday prudence tells you that this email should be treated as toxic spam and deleted immediately. We’ve long stressed that good usage and good grammar establish trust between you and your audience. That’s just as true for email marketing as it is for your website posts. This particular email message, though, sends off all the alarm bells. The writer capitalizes words at random. Some phrases (“Manual Do follow Blog Comments”) are pure gibberish. I don’t even know why “5$” appears in the subject line to mean five dollars, particularly when it’s written properly later on. The writer seems unfamiliar with plainspoken, idiomatic English—a classic warning sign of an overseas scam artist. And what about the two words “The software” floating serenely in space before the first sentence? What are we to make of that? If a well-written piece is designed to instill confidence, then this message should make you very, very afraid. What are the intentions of the person—maybe “james_seo,” maybe “Brayden_Ben,” but really a shadowy figure cloaked in anonymity—who wrote this? What does he want? Where did he get my email address? Is it Simple Incompetence, or Is Someone Being Very, Very Clever? Some researchers have recently put forth the theory that Internet email hoaxes are deliberately written in a clumsy manner. Most readers are savvy enough to throw away the email immediately, of course. But the people who are too trusting or too dumb to reject the message are exactly the scam artist’s “ideal customers.” These marks are the most likely to pass over money, bank account numbers, and other personal information—and then be too embarrassed to contact law enforcement officials afterward. Even if we take that into account, this particular email still fails. Business owners and managers who might desire website backlinks are presumably too sophisticated to ignore the style of the message. They won’t fall victim to the scam. Reportedly, scammers are pleased to get response rates as low as one-half percent (one favorable response for every 200 emails sent out); I doubt this message will score that high. Has your business been targeted for a commercial email scam that promises rewards too good to be true? Tell us about your experience in the comment box on this page. Your story is something that should interest all our readers. Learn How to Build Better Email Promotions in Just One Hour!